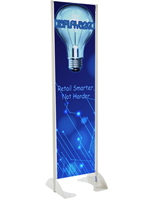 This 20” x 72” gray permanent banner stand is an advertising display solution designed to be mounted outdoors to hard surfaces such as wood, concrete and other suitable materials. 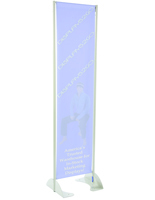 The poster holder is made in the U.S.A from 100% aluminum with a powder coated exterior making each unit capable of withstanding all types of weather and up to 60 MPH winds. 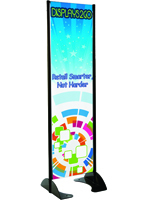 An outdoor banner stand is designed to translate your advertising message to the public when placed in areas with high visibility. 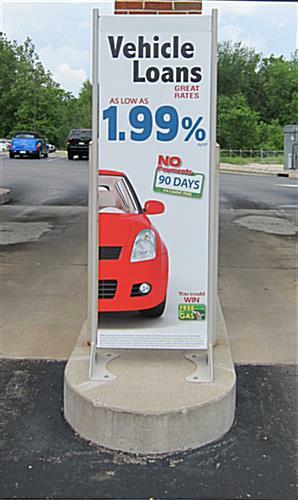 Oftentimes the aluminum display solution with a vertical vinyl poster shown here is found being used at restaurants, shopping malls, banking center islands and parking ramps. 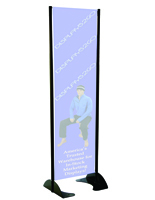 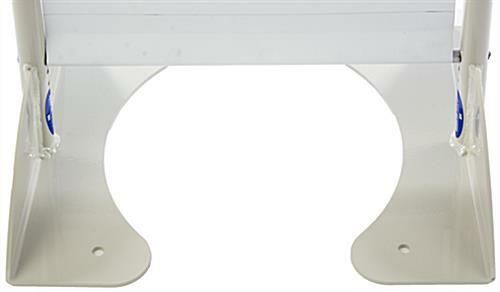 Featuring a spring loaded tension bar, the banner stand holds the single sided vinyl graphic tightly in place. 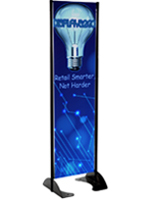 The outdoor display shown here is a high quality fixture that is sure to bring your company many years of high impact marketing!